A first look-see at Mr. Fox on the screen may result in unexpected gasps of wow! You’ll no doubt wonder what the exact process was used to create this vision and why Mr. Fox has fur that looks so real? The answers to these questions are the fact that Wes Anderson’s new film used the old fashioned animation movie-making method called stop-motion. 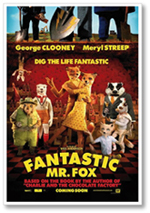 Mr. Fox, voiced by George Clooney, is in fact a puppet that stands in front of an elaborate miniature set similar to those of a Broadway play. The look and feel of the film is artistically eye-popping. Roald Dahl is a British fantasy author who has penned such classics as James and the Giant Peach,Charlie and the Chocolate Factory, Matilda, The Witches, and The BFG (Big Friendly Giant). As a former gifted literature teacher of fourth and fifth grade students, these books, all rich in creativity and advanced vocabulary, were favorites in my classroom. It’s no surprise to me that filmmakers are eager to recreate these children’s novels into film. Thankfully, Fantastic Mr. Fox landed in the right hands as Wes Anderson, who directed such films as “Bottle Rocket” (1996), “Rushmore” (1998), “The Royal Tenenbaums” (2001), “The Life Aquatic with Steve Zissou” (2004), and “The Darjeeling Limited” (2007) clearly has a creative background. An all-star voice cast to be sure Mrs. Fox (Meryl Streep), Ash –the son (Jason Schwartzman), Badger (Bill Murray), Rat (Willem Dafoe), and Coach (Owen Wilson). Each voice adds their own personality to this enhanced script penned by Anderson and Noah Baumbach. New characters were added such as Ash (Mr. and Mrs. Fox’s son), Kristofferson (the perfect nephew) and coach. The highly complex game of ‘whackbat’ was created with several variations on the sport of baseball. Try your hand at the game by visiting the official Fantastic Mr. Fox movie website. The story revolves around Mr. Fox, a family man and newspaper columnist who yearns to go back to the excitement of stealing chickens. It’s not so much the exact moment of gathering the loot that is so appealing, it’s the skill and preparation of the planning of the deed that is so enticing. Of course Mr. Fox can’t help himself and does go back to his ‘sly as a fox’ ways by deciding that all three of the awfully mean farmers (Boggis, Bounce and Bean) who control the valley are in need of a ‘shake up’. During a planning scene with his partner in crime Mole, Mr. Fox as Clooney displays shades of the “Oceans” films as the elaborate map and details of the heist are discussed. All of the animals in the story have human jobs and behave in ways similar to their occupation. Hence, that’s where the comedic tones arise. The film is very funny and entertaining! The animals’ wardrobes are wonderful, especially Mr. Fox’s. His suits could easily be ordered out of a Hart Schaffner and Marx catalogue as the fabrics are exquisite. (Designers actually notified Wes Anderson’s personal tailor for samples of his suit fabrics to create several of Mr. Fox’s suits). I surmise that the attention to detail is a large reason the film is so appealing. The costuming, cinematography, puppets and sets are all amazing. The only drawback is that the film is a tad too long near the middle of the tale. In a side story, Ash is determined to live up to his father’s athletic ability as the ‘whackbat king.’ His attempts at sport are typically met with frustration. Further humiliation ensues as cousin Kristofferson out shines him in every instance. Ash doesn’t give up as he forces his dad to notice him near the end of the film when the valley is up in arms and needs his help in fighting those ‘really mean’ farmers. The musical score also soars as Burl Ives’ banjo music sets a country tone or the Beach Boys are creating a romping good time. Several original songs are included, a standout is ‘Fantastic Mr. Fox AKA Petey’s Song’ by Jarvis Cocker. A sophisticated film for sure, as adults will marvel at the attention to detail and the visually appealing sets. Kids will cheer on Mr. Fox and enjoy the antics as well as the scenes with Ash as he morphs into ‘super fox’ to help his family. George Clooney and Meryl Streep as the star voices shine brightly in this foxy tale that is sure to become a family classic. *The production notes stated that over 500 puppets were used for the film and over 4,000 props. Wes Anderson spent numerous weeks at Roald Dahl’s country estate in England for inspiration.